15U Season (May-June) - Registration Now Open! Register for 15U League Now! 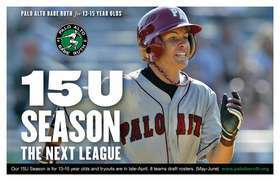 Palo Alto Babe Ruth invites you to register for our upcoming 2019 15U Season. Explore our home page to learn more about Palo Alto Babe Ruth. Click the link above to go directly to the registration site. This season runs from mid-May through the end of June. This is a more competitive league than Prep League, but many of the players who participate in the Prep League will have the opportunity to play on a 15U team. Our 15U tryouts will be held on Sat, April 20 (3-5pm at Baylands) and Sun, April 28 (12-2pm at Gunn High School). Players in our Prep League do not need to attend the 15U tryout since the Prep League serves as their tryout. Following the tryout, a draft will be held on April 30 where selected players will get drafted onto a 15U Team for the duration of their Babe Ruth careers. If your child doesn’t get drafted onto a 15U Team, you’ll receive a 100% refund, which means there’s really zero downside to registering. Our 15U Season is fairly compact, allowing players to enjoy Babe Ruth with minimal travel ball conflicts and fully participate after their high school seasons have finished. At the end of our 15U Season, the top four teams earn the opportunity to compete in our coveted City Championship Tournament. Registration is $450 and closes April 28. Join the fun: We're a volunteer, community-based league, so we welcome all families to apply for Manager/Coaching spots or Board Member roles. Just let us know during registration!. For more information, check out our 2018 Program Book, League FAQs, or contact Chris Lillios (clillios@compuserve.com). 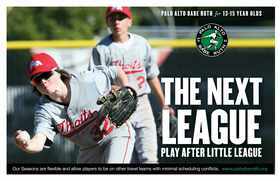 Palo Alto Babe Ruth Baseball is a community-based league on a mission to drive quality youth baseball. We offer up to 5 Seasons: Fall Academy, Winter Tournament, Spring Prep, Summer 15U, and All Stars, providing you with year-round baseball instruction. Choose to play in one season or choose them all, we’ll fit into your schedule! PABR is really The Next League for 13-15 year olds looking to play highly competitive baseball after Little League and throughout high school at the #1 facility in NorCal - the legendary Baylands Athletic Center in Palo Alto. Much like Little League, there’s no reason for a player to make a choice between playing either travel baseball or Babe Ruth, as 80% of rosters play on other travel teams with minimal scheduling conflicts. In addition, we also have no boundary limits and are open to all comers. PABR has been home to many local high school and college all-stars since 1954, including current MLB star Joc Pederson. We hope you decide to register for our next season!